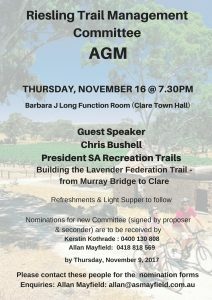 All welcome at the Riesling Trail AGM 2017. 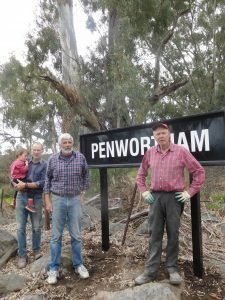 Allan Mayfield, Zach [Allan’s grandson], Trevor Mace and Peter Wood putting up the new sign at Morrison Road. 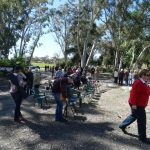 Bungaree Station comenorated its 175th anniversary with a barrow relay ‘Of sheep and vines” attracting a large crowd as it travelled along The Riesling Trail from Sevenhill to Barinia then onto Bungaree. 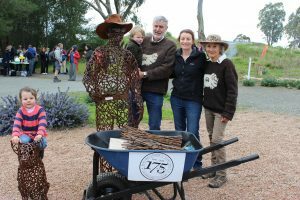 The event was a re-enactment of a similar trek 175 years ago to collect vine vuttings from Sevenhill Cellars for planting at Bungaree and highlighted the important role the station played in the development of the district. 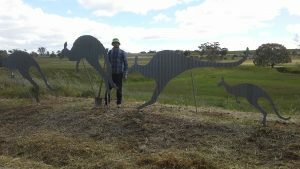 Pictured: Charlotte Stewart, George Hawker holding Angus Stewart, Vicky Stewart of Bungaree Station and Sal Hawker at the sheep sculptures on The Riesling Trail [photo: Sue Wurst]. The Monster Wine Raffle was drawn tonight and here is a list of all the winners, many congratulations to all, and thanks to the very generous donations from the Winemakers to make it such a successful event. Local Artist Paul Leditschke and Riesling Trail Friend Forever, created this fabulous art work. 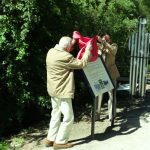 Thank you Paul, from the Riesling Trail Committee. 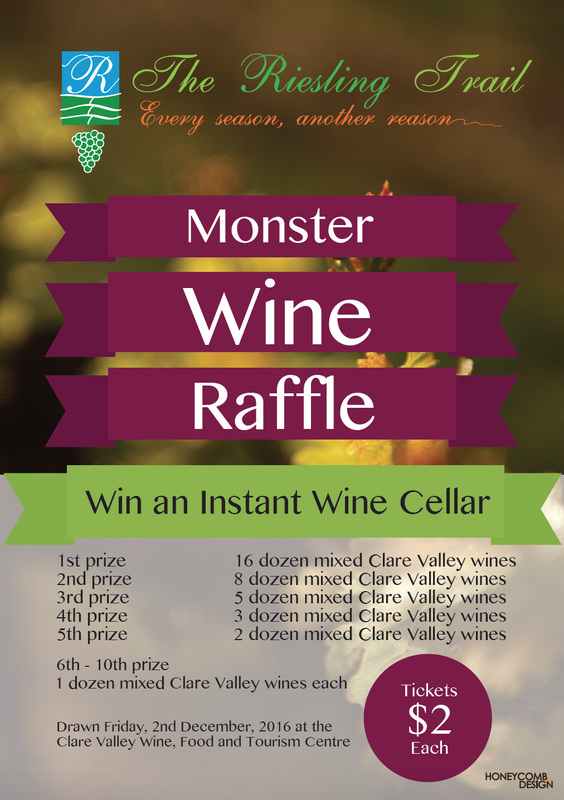 The Riesling Trail has recently launched a ‘Monster Wine Raffle’ with wine donated from over 40 cellar doors. 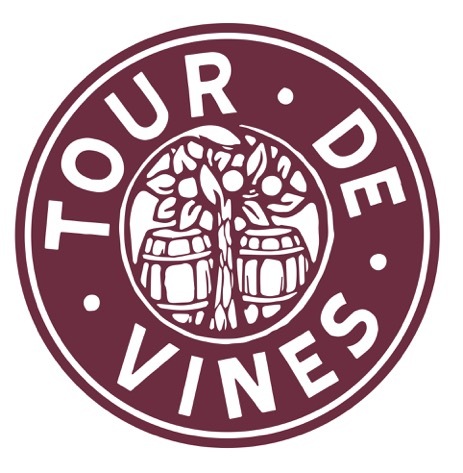 Raffle Tickets are available at many wineries and businesses around the Valley at $2 per ticket. 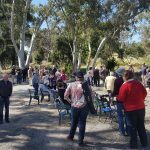 Proceeds will assist in the ongoing maintenance of The Riesling Trail. Roccella, Pierluigi and Paolo (from Padua, Italy). 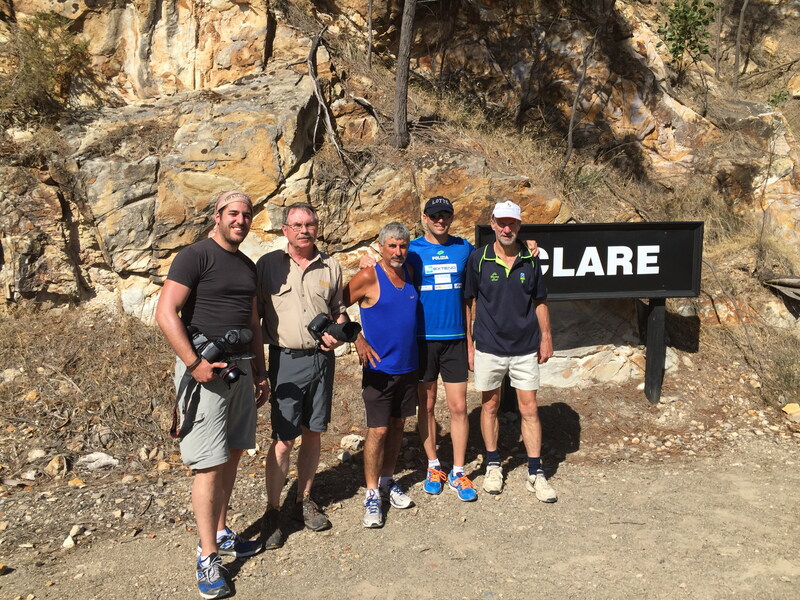 An Italian TV crew from Sky TV Italia was in Clare last week as part of a television documentary about leisurely running. Paolo Venturini, a policeman from Padua, is being filmed running in stunning scenery all around the world. 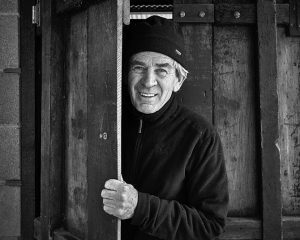 While in Clare they filmed Paolo running along part of the Riesling Trail with local Guilio Dichiera from Evilo Estate who was born in Italy. Guilio is training for the Clare Valley Half Marathon, which is to be held on Sunday 3rd April. 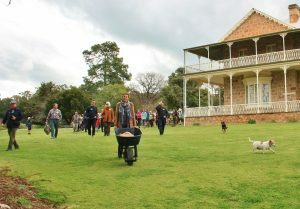 The group from Italy had already been filming on Kangaroo Island and the Barossa Valley before coming to Clare. They were to have come to Australia in October but Paolo had a bicycle accident last year and suffered a punctured lung. 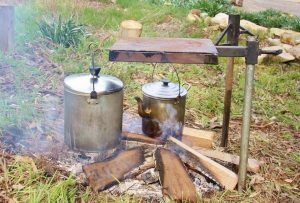 They came to Clare on a 38 degree day and were travelling on to film in the Flinders Ranges the following day. 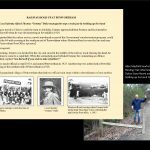 The South Australian Road Runners Club [SARRC] organises several half marathons in South Australia. The first for the year, the Northern Argus Clare Valley Half Marathon, will be held on Sunday 3rd April 2016 on the Riesling Trail.